Here is the first pattern I will share for free on this blog! I'm very excited about releasing this pattern. I hope you enjoy this pattern! I love how the scarf looks! This suit is perfect for a warm spring day! The scarf is a pretty, stylish, accessory that gives this outfit a more relaxed look. I love how textured the dress and jacket are! Length of dress is about knee length (Barbie has such long legs!). Row 1: With Peach, ch 42, hdc in 3rd ch from hook, hdc in each ch across, turn. Rows 2-3: Ch 2, (hdc in back loop of next st, hdc in front loop of the next st) across, turn. Row 4: Ch 2,(2 hdc in back loop of next st, hdc in the front loop of next st, hdc in the back loop of next st, hdc in front loop of next st) across, join to 1st st of row, turn. Rnds 5-6: Repeat row 2, joining at ends of rnd. Rnd 7: Ch 2, (2 hdc in back loop of next st, hdc in front loop of next st, hdc in back loop of next st, hdc in back loop of next st) around, join, turn. Rnds 8-22: Repeat row 2, joining at ends of rnds. Rnd 23: Fasten off Peach. Join on White. Ch 4, 4 tr in same st as joining, (sk 2 sts, 5 tr in next st) across, join. Fasten off. Note: To make top part of dress, you are going to crochet into bottom loops of chs from row 1. You will have 40 sts after row 1 of top. Row 1: With Peach, join onto bottom ch. Ch 4, 1 tr in each ch loop across, turn. Row 2-7: Ch 1, (hdc in back loop of next st, hdc in front loop of next st) across, turn. Row 8: Ch 2, hdc in back loop of next st, (hdc in front loop of next st, hdc in back loop of next st) 5 times, (2 hdc in front loop of next st, 2 hdc in back loops of next 2 sts) across to last 11 sts, (hdc in back loop of next st, hdc in front loop of next st) to end of row, turn. Rows 9-11: Repeat row 2. Row 12: Ch 2, hdc in back loop of next st, (hdc in front loop of next st, hdc in front loop of next st) 5 times, (hdc dec in front loops of next 2 sts, hdc dec in back loops of next st) across to last 11 sts, (hdc in front loop of next st, hdc in back loop of next st) to end of row, turn. Row 13: Repeat row 2. Row 14: Sl st in 1st 14 sts, ch 14, now go back to the 7th st you sl st'ed in, sl st in that st, turn, ch 4, 1 tr in each ch, now back to regular row, sk 2 sts, sl st in next 7 sts, ch 14 sk 7 sts, sl st in next st, turn, ch 4, 1 tr in each ch across, now back to regular row, sk 2 sts, sl st in last 11 sts. Fasten off. Ch 33. Attach one end of ch to end of row 1 of top (tr row) weave through trs. Attach end to end of row. Weave in all ends. Sew snaps down back of dress. Row 1: Ch 52, hdc in 3rd ch from hook, hdc in each ch across, turn. Row 2-4: Ch 2, (hdc in back loop of next st, hdc in front loop of next st) across, turn. Rows 5-9: Ch 2, hdc dec in back loops of next st, (hdc in front loop of next st, hdc in back loop of next st) across, to last 2 sts, hdc dec in front loops of last 2 sts, turn. Rows 12-15: Ch 2, (hdc in back loop of next st, hdc in the front loop of next st) across, turn. At end of row 15, fasten off. Row 11: Sk 4 sts from left shoulder, join in next st, ch 2 (hdc in back loop of next st, hdc in front loop of next st) across, to last 10 sts, turn, leaving remaining sts unworked. Row 12-16: Ch 2, (hdc in back loop of next st, hdc in front loop of next st) across, turn. Fasten off at end of row 16. Turn piece over and repeat left shoulder on this side. Matching sts, sew shoulders to back. Weave in all ends. Rnd 1: Join Peach thread in any st in armhole, ch 2, 20 hdc evenly spaced around, join to 1st st of rnd, turn. Rnds 2-4: Ch 2, (hdc in back loop of next st, hdc in front loop of next st) around, join, turn. At end of rnd 4, join on white. Rnd 5: Ch 4, 4 tr in same st, (sk 2 sts, 5 tr in next st) around, join. Fasten off. Weave in all ends. With Peach, join at bottom right corner, ch 1, sc around jacket. When you reach a corner, 3 sc in corner. Rnd 1: Ch 6, join with sl st in 1st ch. 12 sc in ring, join. Rnd 2: Ch 4, (5 tr) in each st around, join. Sl st down wrong side of piece to center, ch 40, sl st in center again. Fasten off. Weave in ends. Row 1: Ch 83, dc in 8th ch from hook, (ch 2, sk 2 sts, dc in next st) across, turn. Row 2: Ch 7, dc in 2nd ch space, (ch 2, dc in next ch 2 sp) across, turn. Row 3: Ch 5, dc in same ch space, (ch 2, dc in next ch space) across, turn. Fasten off. Weave in ends. Add fringe if desired. For the pearl jewelry I used stretchy bead string and 3 mm beads. Simply string the beads onto the string until the desired length is achieved. Let me know if you have any problems or questions with this pattern. If you don't understand a certain part of this pattern, let me know and I can add more detail. Thank you so much, Rosemary! This is one of my favorite outfits. Thank you! I had lots of fun designing it. Hi, Tess! Welcome to the blogging world. What a great crochet pattern! 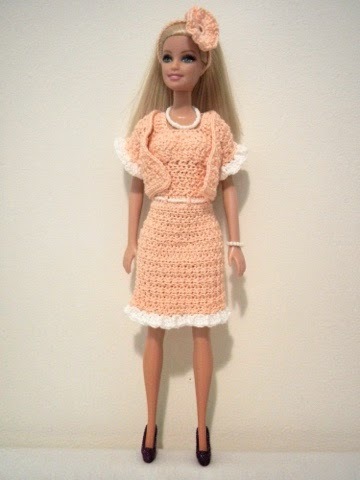 I remember crocheting clothes for my dolls when I was younger, although I don't know that any looked as nice as this suit. Hi Rachel! Thank you so much for that sweet compliment. I'll ask my mom if she would be okay with the link up. I would love to do it.